Discovered by: Known since ancient times. Sulfur (also spelled as Sulphur) is a chemical element in the periodic table having the atomic number of 16. It is mostly known for causing very bad smells, but in reality, the pure sulfur is odorless nonmetal element. The smells that irritate us are actually the compounds of sulfur, e.g. Hydrogen Sulfide smells like rotten eggs. Sulfur is yellow colored nonmetal solid. It has 30 allotropes (Allotropes are made of the same element, but their atoms are organized differently). Sulfur can’t be dissolved in the water. However, it can be dissolved in organic liquids. Sulfur is used to make sulfuric acid. Sulfuric acid is a strong acid which is used in your car batteries. But, it has many other industrial applications too. It is used for water processing, oil refining, and making fertilizers. It is used for making gunpowder that is used in bullets, and hobby rockets. Sulfur is the 10th most abundant element in the universe, and 17th most abundant in Earth’s crust. Sulfur is found in many places around the world. The places where the sulfur is likely found are volcanic sites, natural geysers, hydro-thermal vents, and hot water springs. Sulfur is found in both pure forms and in minerals. Some minerals of sulfur are pyrite, barite, and gypsum. The largest sulfur producing country is China. Other countries that also produce sulfur are US, Canada, and Russia. Sulfur is available in its pure form in nature, so ancient people had known about the sulfur. Chinese had known the reactivity and uses of sulfur in medicines and black gunpowder. They used black gunpowder in fireworks. 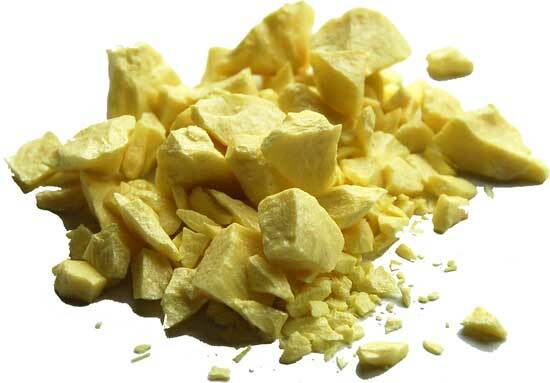 Sulfur was considered as a compound rather than an element. It was proved by Antoine Lavoisier in 1777 that sulfur is an element. The 8th most abundant element in our bodies is sulfur. Sulfur dioxide is a toxic gas released mostly by power plants and factories. When this gas mixes with moisture in the atmosphere it causes acid rain. Abdul Wahab, "Sulfur," in Science4Fun, April 13, 2019, http://science4fun.info/sulfur/.